Learn all you need to know about our 42mm 6×36 stainless steel wire rope right here, from its cores and capacities to its design and durability. When you are on track to make an order, call or email using our contact details, found further down the page. 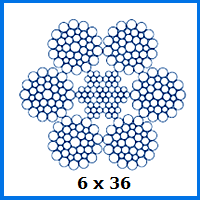 Unlike some wire rope, the entire 6×36 range is listed with not one load limit, but two. This is due to the two core types that are available; fibre and steel. The maximum weight that the fibre core edition of this 42mm rope can safely manage is 93,163kg. For the steel wire core, this rises to 100,503kg, with the increased capacity coming at the cost of flexibleness. Read up on stainless steel and you will know that it does not corrode in the same way as rival materials. When used to make a wire rope, it leads to longer life and a polished outer surface. Stainless steel rope has its uses, but our customers can request other products from Rope Services Direct and expect to get the same level of personalisation as part of the production process. If you need gym cables, these are available in whatever length and with whatever fittings you desire. If you need custom crane rope, we have all the bases covered. See what we can do for you by calling 01384 78004 and talking to a sales specialist today. Author an email to us from our website if a chat on the phone is not possible at the moment. 42mm 6x36 Stainless Steel Wire Rope Overall rating: 5 out of 5 based on 6 reviews.